Google Analytics is the most widely used statistics package for websites. It is used on more than half of the sites on the internet. One of the most powerful features is its ability to track the actions that users take on your website. This is the ‘goals’ feature. This means you can segment out the portion of traffic that did something on your site. The most popular use of this is to track lead collection on your site though contact forms. If you get the message about how to enable goals, this is the process to follow. 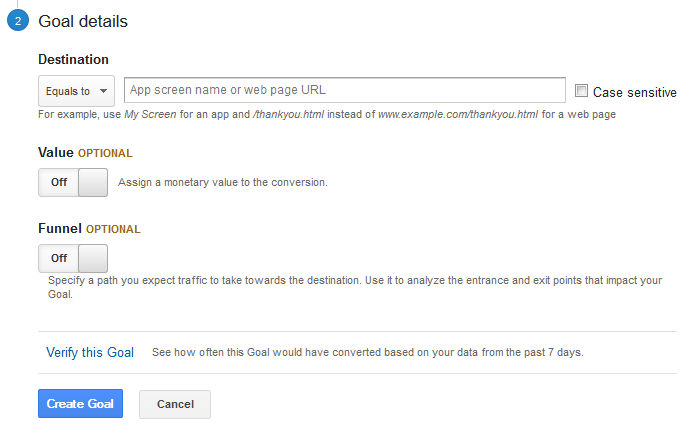 Note: you will need to be an Admin on the Google Analytics account to set this us. 2. Click ‘Admin’ on the top grey bar (to the right of “Customization”). 3. Select ‘Goals’ from the menu on the right-hand side. 4. Click the big red ‘+ New Goal’ button. Name – enter a useful name, e.g. contact form, application form, sale complete, table booking etc. Type – As we are tracking leads, we need to know they have completed the form, so this will be a Destination goal. Destination – this is the page name you identified in step 1. Value – in the main, you won’t have a value for this as it is a lead. However, if you are sufficiently advanced in your marketing to know your customer lifetime value then you could divide this number by your lead to customer conversion rate, and use this number. 7. At the bottom of this page, you will see “Verify this Goal”. If you click this, it will tell you how many conversions you had in the past 7 days. If you see a 0% figure, there are two options, either your URL is wrong or you haven’t had any forms filled in! 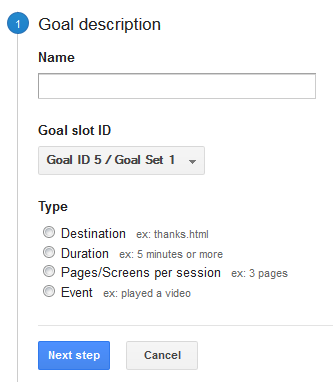 Check your details, and when you are happy, click “Create Goal”. 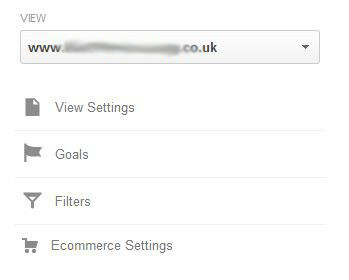 Please note, Goals are not retrospective (apart from the verify feature), so you will only see results from the point you set this up. It is important also to know that Google Analytics uses the “last click attribution” mechanism, which shouldn’t be used in isolation for measuring the success of your digital marketing efforts. See Don’t fall into the trap of last click attribution for more information. Can you use goals to measure sales? It depends. You can use goal tracking to measure the checkout process and payment complete pages, but it really only works properly when you have a single product with a single price. In a multi-product, multi-price environment you would want to set up Google Analytics Ecommerce tracking. 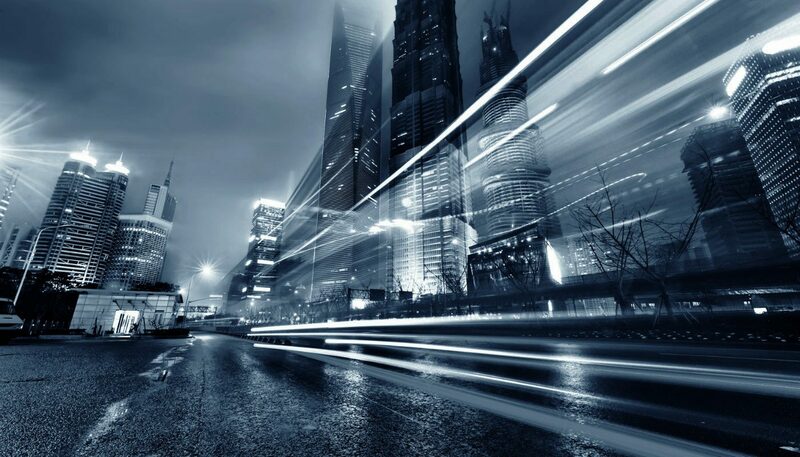 Ecommerce tracking will give you far more information on product sales, volumes and performance, and I would recommend enabling it if you sell online. In many ecommerce systems, such as Magento, turning on this tracking is a simple tick box operation. This is useful for finding any issues that might exist with your process. For instance, if you are using this to follow a checkout process, if lots of people break off the process to go and look at the delivery costs page, then this is an indication that there is not enough information on delivery. Thus delivery mentions need to be improved before or during the purchase process. If you have a multi-page application process and you lose a large number of people at stage 3 – where they have to supply information that they might not have to hand – then you could improve the introduction text to encourage users to have their documentation to hand.